What did the Emperor do here, one night a year? About how high is the Hall of Good Harvest? 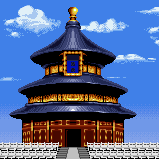 Tian Tan, the Temple of Heaven, is China's most famous temple. It consists of several buildings, built around the 15th century, all set inside a walled park. The Hall of Good Harvest, the most well known of the park's buildings, is set on top of a triple tier of marble terraces. Each carved terrace has its own balcony. The 123 foot high structure is amazing because it was built without one single nail. The Emperor of China would spend one evening a year in the Temple, fasting and praying, to assure a good harvest for China's many farmers. This page was last edited on March 29, 2018, at 18:21.